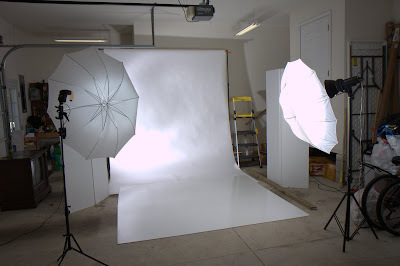 Here is a pic of the studio I like the lighting better using my off camera flash (camera left) along with my studio flashes. Miss LoLo got a new 42 inch flat panel TV for Christmas. Out with the old, and in with the new. It'll be interesting to see what kind of whining and wailing will go on when analog signals are no longer broadcast in a month or so. 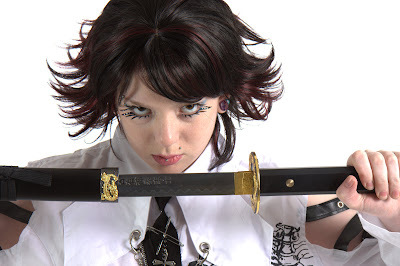 LoLo did this kind of Japanese Schoolgirl with a sword concept. This is so fun Dave, thanks for showing your set-up too, that always helps figure out how you created the lighting.